In London, England, on a chilly, overcast morning in October 1618, an executioner held his bloody axe in one hand and with the other raised a severed head to the crowd that had gathered in the Old Palace Yard at Westminster. Sir Walter Raleigh, a man who personified the national ambitions of England in the “Age of Discovery,” was dead. Why did this daring soldier, explorer, historian, and once trusted advisor to Queen Elizabeth end his life on the chopping block? Answers to this question, along with many others pertaining to the man for whom North Carolina’s capital is named, can be found in the Sir Walter Raleigh Collection, which is one of the larger and more historically valuable special collections within the North Carolina Collection. Selections from the Sir Walter Raleigh Collection and other related artifacts are on display in the NCC Gallery. The Gallery’s Sir Walter Raleigh Rooms feature English furniture from the late Elizabethan and Jacobean periods (ca. 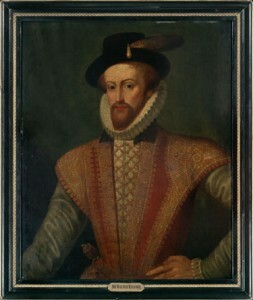 1590s-1625). The oak paneling in these rooms also dates from the Elizabethan period and once graced a manor home in England. It was donated to the North Carolina Collection and relocated to Wilson Library in the late 1940s. Although the ornate plaster ceiling and oak-plank flooring in the Raleigh Rooms are reproductions, these elements are constructed in a manner and style consistent with the period. In addition to period furnishings, the Raleigh Rooms are decorated with a fine oil portrait of Sir Walter dating from 1593, with framed antique maps, a large detailed ship model, and an intricately carved, larger-than-life wooden statue of the knight. Adjacent to the Raleigh Rooms in the NCC Gallery’s main display area are other exhibits that focus on Raleigh’s ill-fated efforts in the 1580s to establish a permanent English colony at Roanoke, along the coast of what is today part of Dare County, N.C.